As most already know, solar energy is the energy released by the sun, which is used to heat and light Earth’s surface. However, it is less likely that many of us know much specifically about the invention of the solar-powered aircraft! I recently was intrigued by this phenomenon after coming across an article titled, “Solar Powered Aircraft: A Flight Of Fancy?” written by Anmar Frangoul, that focuses on the exciting journey of two “innovators” (paragraph 1), as Frangoul puts it, who plan to fly all the way around the world (beginning in Abu Dhabi) aboard the “Si2” or the “Solar Impulse 2”. The Si2 (shown above in Figure 1 and 2) was built with a 72-meter wingspan (designed using carbon fiber- see Figure 3 above), and receives its power to charge its 633-kilogram lithium batteries by use of sunlight energy. Therefore, it can be inferred that the batteries for the solar-powered aircraft are only able to charge during the daytime when the sun is out and shining. Remember, the plane’s wingspan is 72 meters – that’s more than 220 feet! This giant wingspan is covered with cells that collect the sun’s rays. With the help of its 17, 000 solar cells, the plane actually receives enough charge throughout the day, and the powerful batteries charge quickly enough, so that the plane could continue to successfully run during the entire night, without help from the sun. The solar powered aircraft is interesting to me mainly because it is different from other vehicles that run on sunlight energy. 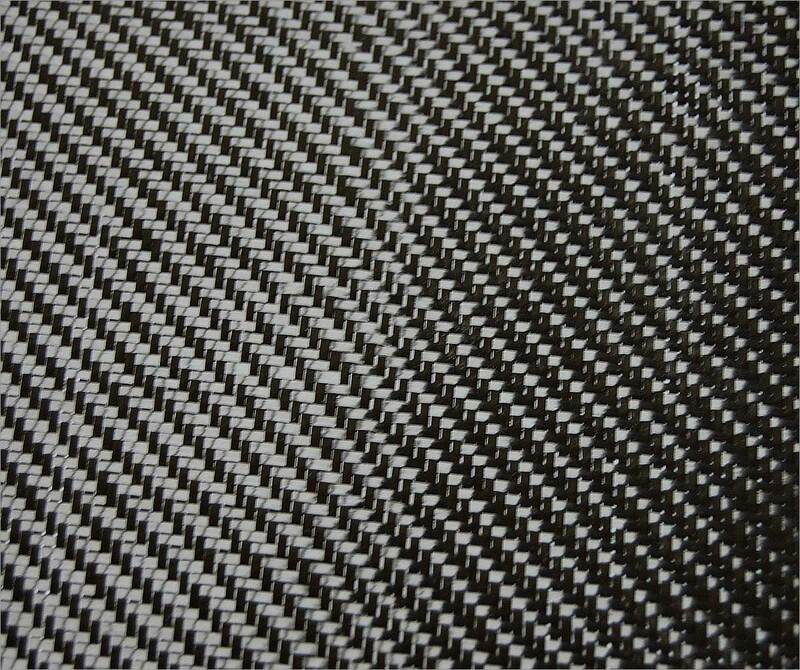 For example, in comparison with solar-powered cars, the aircraft is not hybrid. Instead, it is completely electric and solely powered by solar energy. This means that it really is totally clean when it runs, and emits no pollution. And because it’s efficient enough, with enough charging capability and capacitance or storage, it can go seemingly forever. I wonder about the lithium batteries, if they need to be discarded now and then replaced, and what the pollution impact is from one of these batteries. 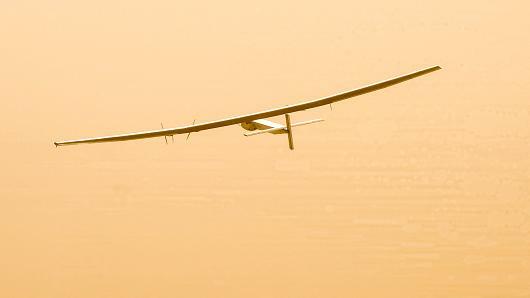 In addition to its uniqueness, the future capabilities of the solar-powered aircraft (such as the Si2) excite me because of the potential benefits. 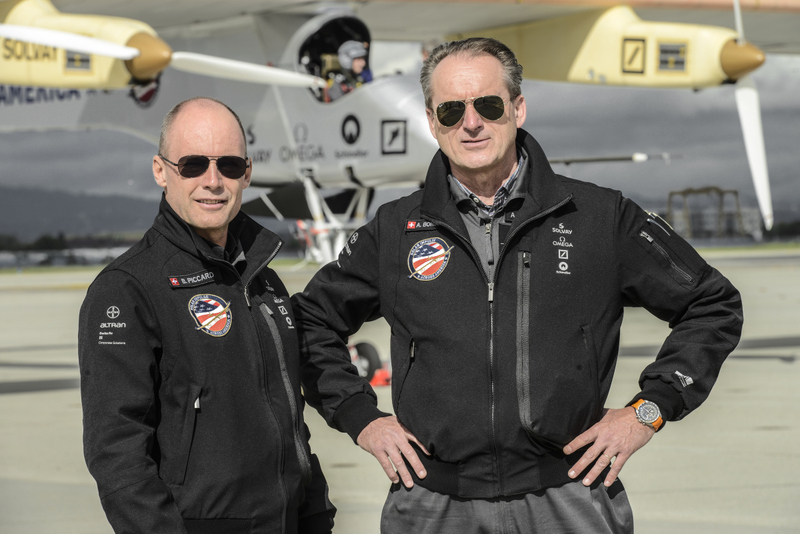 Bertrand Piccard and Andre Borschberg (pictured in Figure 4 above), who invented the plane’s technology, are currently flying it around the world. One of the goals of this flight is to demonstrate the amazing storage power of the batteries, and that the plane can fly across an entire ocean overnight, with no sunlight. If this Si2 mission is successful, then a whole new window will open up for solar energy. Solar energy, which is currently determined to be clean, but extremely inefficient and costly, (low percentage of solar energy actually gets converted into electricity and used, especially compared to energy powered by gas or coal), will suddenly be deemed a cost-effective form of energy. The Si2 plane is quite large, but if we can make the solar cells be twice as efficient as they are now, then we only would need half those cells. If solar energy were made more efficient, we could do a lot more with it, for other than the efficiency issue, solar energy is quite remarkable!